The material on this volume ranges from close-up to stand-up, from easy to difficult, and from cards to coins to ropes to tape measures to bills. But from start to finish, it's all audience-tested and approved magic. 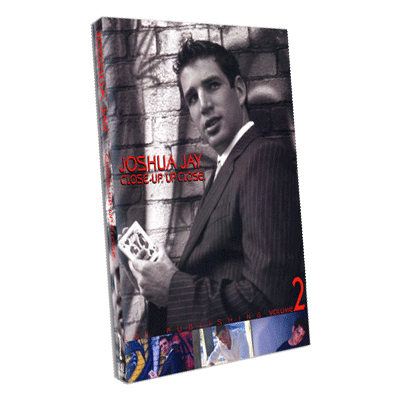 Also included are performance clips from Joshua's one-man show, a detailed discussion of practical memorized deck magic (that won't disturb your stack), and a making-of featurette. Shrunken Revelation: Joshua has performed this trick on national television in four different countries and it won first place in the Marvin's Magic video competition at FISM 2000. Four Kings appear on four packets and then visually shrink to miniature cards. Printing (Performance only): See Joshua's explosive handling of Dominique Duvivier's classic effect. Inflated Transposition: A dollar bill transposition with a new kicker-impromptu, easy-to-do, and perfect for walk-around professionals. Heightened Senses: Predict any spectator's height with an "X" on a tape measure. The method is as ingenious as the effect! The Lampshade (performance only): Straight from his one-man show, this is Joshua's acclaimed chop cup routine to music using a lampshade and a bulb. Pulling My String: The perfect opener to any rope routine. Stretch a tiny rope over seven feet...visually. Dear Journal: This trick won the IBM creativity award in 1998. A "journal" deck is shown, each card bearing a different journal entry. Joshua divines not only a selected "journal" card, but even what entry is written on it! Plus: Princess in my Wallet, Invisible Coin Purse, Jumbo Homing Card, Prediction Piece, Combined Interests, and a detailed discussion on memorized deck magic-from the point of view of a worker. You'll learn the work Joshua puts in the deck, an extremely deceptive in-the-hands false shuffle, and several routines that don't disturb the stack. Extra Feature: A behind-the-scenes documentary detailing what happened behind the cameras at every stage of Close-Up. Up Close.